Woodland Burials Manchester, Cheshire & South Lancashire. Woodland burial – also be known as natural burial or green burial – has become an increasingly popular choice in the UK. 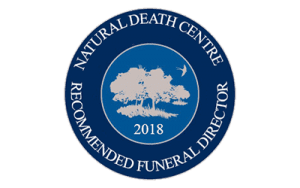 As your funeral director, we can arrange woodland burial or natural burial throughout the North West. We have detailed knowledge of the woodland burial sites available for use in the North West, and will be happy to advise you regarding the benefits of each. There are quite a few different options, each with a different character. We are regularly consulted for advice by new sites that are opening. All of the pictures shown are of natural burial sites that we use. Some of these woodland cemeteries are a piece of land that will mature into a piece of woodland in the future. Others are already set in amongst mature trees and are especially landscaped for their particular use. Alternatively we can arrange a burial on your own land. Graves aren’t marked with vertical marble headstones as they are in traditional cemeteries. Graves are either left unmarked (though logged on plans) or they have a small wooden marker or a horizontal flat engraved natural stone marker. One of the advantages of these kind of graves is that they don’t have to be maintained in the way that old style graves do. Many woodland and natural burial grounds discourage items being left on graves and they want only native trees and plants to be planted. Most can’t allow a tree on each grave, as not all the trees would survive in close proximity to each other. The cemeteries that don’t allow a tree on the actual grave will have other areas where trees and shrubs can be dedicated to a loved one. Many of these natural/woodland burial grounds require that an eco-coffin be used. An eco-coffin is biodegradable and has no metal parts or plastic that can’t break down. Examples are coffins made from cardboard, willow, bamboo, wool, seagrass, pandanus and jute. Some also accept lambswool shrouds. For a more traditional aesthetic we have wooden coffins from sustainable wood sources. It would also be considered more eco-friendly if the person hasn’t been embalmed, though embalmed bodies will be accepted into these natural burial grounds. This is an image of the Woodland Burial Area in Blackley. A special electric hearse takes the coffin up to the top of the hill where the graves are situated amongst mature trees. There are nice views of Heaton Park. Graves are left very natural and plain, but there are options to have memorial birdboxes or an inscribed natural stone plaque. The service can be either graveside or in one of the Blackley Cemetery chapels.